Short & sweet announcement: all @Pixar theatrical shorts will be on #DisneyPlus at launch! Have you herd? 🐑 @ToyStory‘s Bo Peep will be coming home to #DisneyPlus in her very own @Pixar short, Lamp Life. Ahead of Toy Story 4‘s release (posts on the press day last week will be coming soon! ), the shorts centering on Forky and Bo Peep, stars of the fourth film, will definitely be ones not to miss. It’s a brilliant idea. I personally, would still love short films from The Incredibles universe, but maybe those are still possible! There’s been a lot of discussion surrounding the unlimited options with streaming these days, much of it wary and negative. Disney now joining Netflix, the newly launched Criterion channel and Apple+, along with HBO Go, Hulu et al, means people are going to pay more for content that’s no longer as inaccessible. We hope it’s a success. Stay tuned for more news on Disney+. Disney, John Ratzenberger, Monsters At Work, Monsters, Inc.
We’ve known that a new Monsters, Inc. animated series has been in the works for a good while now, but today an official title and voice cast were revealed. The series, which is being developed for Disney’s upcoming video subscription service Disney+, will be called ‘Monsters At Work’, and will arrive in 2020. ‘Monsters At Work’ will take place just six months after the events of Monsters, Inc. Mike and Sulley will have fully settled into their new roles as Jokesters on the Laugh Floor, and who knows how serious Mike and Celia’s relationship will have gotten? Tylor Tuskmon, a young mechanic who dreams of working alongside Mike and Sulley on the Laugh Floor, will be voiced by Ben Feldman, and he’ll be joined by a whole host of other characters: Bernard (also voiced by John Ratzenberger), Val Little (voiced by Kelly Marie Tran), Fritz (voiced by Henry Winkler), Duncan (voiced by Lucas Neff), Cutter (voiced by Alanna Ubach), Smitty and Needleman (both voiced by Stephen Stanton) and Millie Tuskmon (voiced by Aisha Tyler). A quick aside – Alanna Ubach has voiced a Pixar character before: Mama Imelda in Coco! A lot of the newly revealed voice actors have been tweeting about their excitement, so it’s easy to tell ‘Monsters At Work’ has had a lot of heart put into it. We’ll be looking forward to teasers and sneak peeks of the look of the series, which will hopefully be coming our way in the next few months. The Disney store and shopDisney have released new Toy Story Shufflerz collectibles. 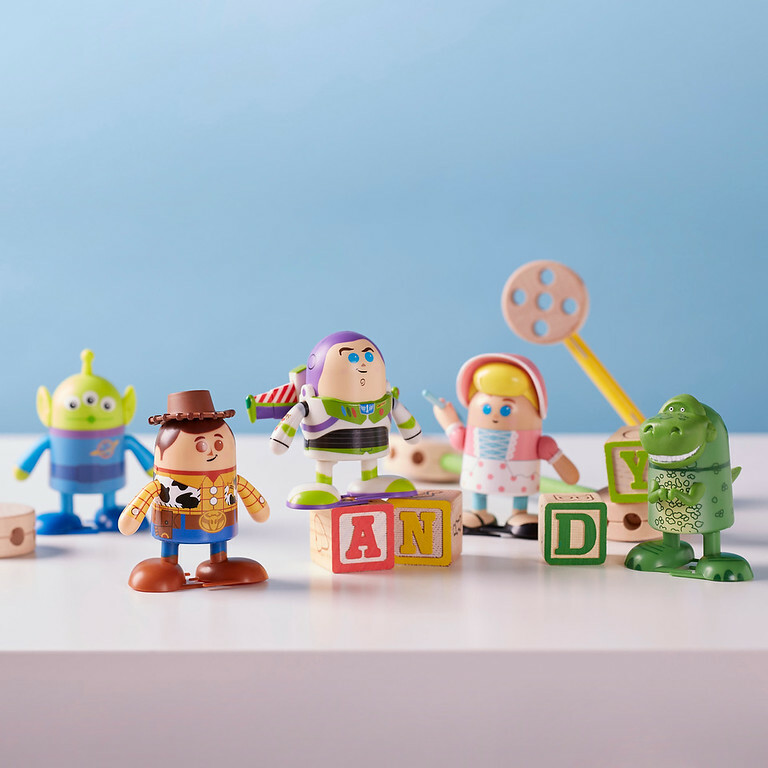 The limited edition toys feature your favorite characters from the beloved Toy Story films: Woody, Buzz, Rex, Bo Peep and Alien. On the 4th Saturday of each month Disney/Pixar will be celebrating a different Toy Story film in anticipation for Toy Story 4, which comes to cinemas June 21, 2019. The Toy Story Shufflerz are compact, adorable, and filled with energy that will keep you and your loved ones entertained for days. Not only do they perfectly depict the iconic characters from the films, but when you press the top of the toys 10 times, they suddenly become alive as they aptly “shuffle” away from you. Check out the toys below, and be sure to collect yours soon at a Disney Store near you or online at shopDisney. Pixar Fest is coming to Disneyland! Not only that, but a brand spanking new Pixar-themed area will be at Disney’s Hollywood Studios soon! According to Oh My Disney, Pixar Fest will be coming to both Disneyland and Disney’s California Adventure beginning April 13th, 2018! That’s only five months away! Unfortunately the event will be for a limited time, but during April you will get to see both parks completely dedicated to the world of Pixar. 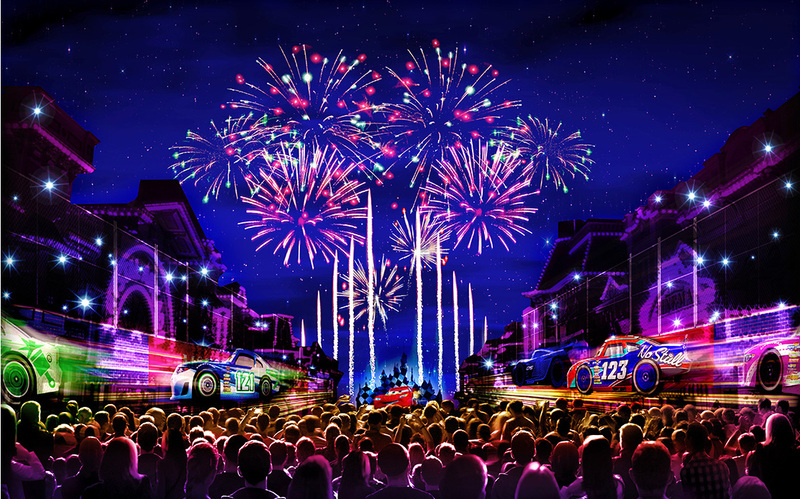 The parks will include a new fireworks show, two new Pixar-themed parades, new merchandise, food and drinks, and more! The nighttime spectacular will feature a brand new fireworks display with Buzz Lightyear flying over Sleeping Beauty’s Castle. The main focus of the show, as the Together Forever title suggests, will be about the special bond between friends and celebrate the true meaning of friendship. You guessed it, not only will Luxo the Lamp be in this Disneyland parade, but characters from films like Inside Out and Up will also make appearances. The Disney California Adventure parade will showcase characters from Monsters Inc., Toy Story, and Cars. You can finally watch some of Pixar’s short films at the Sunset Showcase Theater in Disney California Adventure’s Hollywood Land. Be sure to pick up one of the exclusive merchandise items that will be for sale, which includes Pixar-themed charm bracelets. As the concept art depicts, Woody’s Lunch Box will feature a plethora of different toys from Andy’s collection, even showing off some of Andy’s lunch box items. It will certainly be thrilling walking among some of the iconic Toy Story toys in Woody’s Lunch Box AND celebrating the studio with Pixar Fest – it’ll feel like we’re finally apart of the magic behind a Pixar film. Disney and Pixar revealed today that instead of being paired with an original Pixar short, Coco will have a new Frozen featurette played before it – Olaf’s Frozen Adventure. This is not the first spin-off from Disney’s ever-popular Frozen franchise, with the short Frozen Fever debuting alongside their live-action Cinderella in 2015. However, Olaf’s Frozen Adventure will be a whopping 21 minutes long. It’s unusual that it’s being played before a Pixar movie, where original short films have become something of a tradition. A little disappointingly, this means we won’t be seeing another brand new short created by Pixar Studios this November when Coco is released – all the more reason to get excited for LOU which will be playing before Cars 3 in just 3 days in North American theatres! Pixar heads to D23 in August with its very own booth + more! Disney’s D23 expo is returning to the Anaheim Convention Center this August, and with plenty of Pixar awesomeness in tow! With exclusive sneak peaks at upcoming films, a wealth of informative panels, and favorite filmmakers/celebrities, D23 is definitely the ultimate Disney fan event. Pixar will have its first ever booth at the expo, along with some “provocative panels”, and a John Lasseter Hawaiian shirt exhibit. Check out the full list below. BURBANK, Calif. – June 25, 2015 – Buzz Lightyear will welcome visitors to D23 EXPO 2015 as Pixar Animation Studios celebrates the 20-year anniversary of Toy Story, among a host of exciting presentations, demonstrations and panels that pay homage to Pixar’s past while looking ahead to its roster of exciting new films. 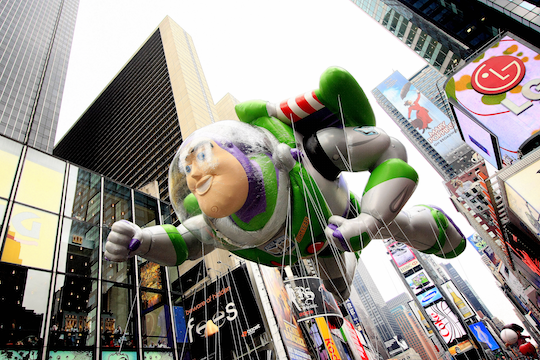 The fearless space ranger, who appeared in Pixar’s groundbreaking CG-animated feature-film debut Toy Story in 1995, as well as Toy Story 2 (1999) and Toy Story 3 (2010), has taken flight in Macy’s Thanksgiving Day Parade® six times as a giant character helium balloon, measuring 67.7-feet long, 39.9-feet wide and 34.3-feet tall. This summer, the Disney•Pixar Buzz Lightyear balloon travels to the West Coast for the first time ever, welcoming guests to D23 EXPO 2015 as it soars outside the Anaheim Convention Center on Friday, Aug. 14, 2015. D23 EXPO 2015 takes place through August 16. After meeting the Emotions inside the mind of an 11-year-old, taking a trip to San Fransokyo where a boy genius and his robot save the world, and falling in love with a queen with icy powers who wants to “let it go,” come see where Walt Disney and Pixar Animation Studios plan to take you next. In what has become a D23 EXPO must-see, host John Lasseter, chief creative officer of Walt Disney and Pixar Animation Studios, presents “Every Story is a Journey.” Filmmakers will unveil never-before-seen footage from Pixar’s upcoming The Good Dinosaur and Finding Dory and Disney Animation’s Zootopia and Moana. The event will include surprise announcements, musical performances, and appearances by the films’ star voice talent. Cell phones, cameras and all recording devices will be checked for this presentation. Get the inside story on the making of Pixar’s latest summer release Inside Out. Hear from Academy Award®-winning director Pete Docter (Up, Monsters, Inc.) and producer Jonas Rivera (Up) as they reminisce and share their personal stories of creating a world that everyone knows, but no one has ever seen. Pete Docter and Jonas Rivera at the 2013 D23 expo. Pixar Secrets Revealed! Hear the Stories They Didn’t Want You to Know! Ever wonder where your favorite Pixar stories began? Hear the stories you don’t know about the classic films that you love. Pixar senior development executive Mary Coleman hosts this experience, welcoming the storytellers behind some of Pixar’s most successful films, including Darla K. Anderson (A Bug’s Life, Monsters, Inc., Cars, Toy Story 3), Mark Andrews (The Incredibles, Ratatouille, Brave), Ronnie del Carmen (Up, Inside Out) and Dan Scanlon (Cars, Toy Story 3, Monsters University), as they talk about the twists and turns of crafting a narrative and share some of the crazy story ideas that didn’t make the final cut. From flipbooks to feature films, animation has taken audiences to fantastical new worlds, far beyond the limits of any real-world setting. Pixar Animation Studios has been at the forefront of this evolution, blurring the line between art and technology and bringing beloved characters to life with heart and humor. As we celebrate the 20th anniversary of 1995’s Toy Story, the first computer-animated feature film, join members of the original crew, including filmmakers John Lasseter, Pete Docter, Andrew Stanton, Lee Unkrich, Galyn Susman, Ralph Eggleston, Sharon Calahan, Eben Ostby, Bob Pauley and Bill Reeves as they share their stories and the challenges they faced along the way. For the first time ever, Pixar Animation Studios is creating a show-floor experience at D23 EXPO. Pixar teams up with Walt Disney Animation Studios for an unforgettable adventure that showcases magic from both animation studios, featuring live demonstrations, presentations and autograph signings with top filmmakers, free giveaways and interactive displays. With highlights from films like Inside Out, The Good Dinosaur, Zootopia, Finding Dory and Moana, animation fans will get the inside scoop on their favorite films and characters. Chief Creative Officer of Walt Disney and Pixar Animation Studios John Lasseter takes Disney and Pixar animation to heart—literally. For nearly every film—from Finding Nemo and Wreck-It Ralph to Frozen and Inside Out, Lasseter has commissioned an exclusive movie-themed Hawaiian shirt. And those who know the Oscar®-winning storyteller know that he loves his Hawaiian shirts—and dons one for almost every occasion. Animation fans will see their favorite film characters “materialize” before their eyes in this colorful collection, which will be exhibited on the show floor. Fans can take home their own shirt, thanks to Disney Store at D23 EXPO. This D23-exclusive Reyn Spooner-design features characters from all the feature films produced under the creative guidance of Lasseter. The simple, appealing collage joins many of Disney’s and Pixar’s most beloved recent characters on one wearable canvas. The shirt will retail for $99.95. There’s so much to be excited about! The D23 expo will be held from August 14-16. Pixar kicked off D23 with a bang this morning, giving in-depths glimpses at three of the studio’s upcoming films: The Good Dinosaur, Inside Out, and Finding Dory. The biggest chunk of the panel was spent on The Good Dinosaur, the next film on Pixar’s schedule. Producer Denise Ream took the stage to discuss more about the movie’s story, which focuses on an Apatosaurus named Arlo (Lucas Neff). His parents are John Lithgow and Frances McDormand, and his siblings Forrest, Cliff, and Ivy are played by Bill Hader, Neil Patrick Harris, and Judy Greer, respectively. The studio also screened a handful of clips to set the stage for the story. The first reiterated what we already know: 65 million years ago, an asteroid is hurtling towards Earth. However, it narrowly misses the planet as the dinosaurs watch from the surface. Their lives go on, and the course of history is forever changed. Years later, the dinosaurs have developed an agrarian society. A wordless clip showed various dinosaurs tending to the fields, using their physical traits to their advantage on the farm. The dinosaurs struggle to deal with pests that destroy their crops, but Arlo takes a liking to them. In a third piece of footage, it’s revealed that these pests are in fact armored humans, incapable of speech. Arlo runs into a fearless young boy named Spot, but the two don’t get off on the right foot together. Eventually, circumstances force Arlo and Spot to go on some sort of quest. It sounds like a very unique concept for the studio, and there’s a ton of potential for an interesting and heartfelt story. We should hear (and hopefully see) more about the film tomorrow after D23’s The Art of The Good Dinosaur panel. Additionally, Pixar confirmed that a new short in the Monsters University universe titled Party Central will play before The Good Dinosaur! The short was screened at the panel, and early reactions are extremely positive. Look forward to more on that soon. The Good Dinosaur and Party Central are set to arrive on May 30 next year. Check back shortly for summaries of Inside Out and Finding Dory news from the panel. Disney Interactive Officially Reveals ‘Disney Infinity’! Rumors have been circulating for months surrounding a revolutionary announcement from Disney’s video game subsidiary. Last December, Polygon provided an extensive early look at Disney Infinity, set to bring together multiple Disney and Pixar franchises in a creative sandbox-style game. Finally, Disney has provided the first official details on this ambitious multi-franchise, multi-platform game! Along with character figurines, Disney will also sell game worlds in the form of "playsets." By far the most fascinating element of Infinity, though, is the Toybox mode. Taking pages from Minecraft and LittleBigPlanet, the game features a robust level editor that even includes some programming features, allowing players to create new game modes. Much like LBP, levels and modes can even be shared online and downloaded by others. Provided that Avalanche Studios can make good on these exciting promises (and I have faith that they will), Disney Infinity could be a much-needed hit for Disney Interactive. We won’t have to wait long to find out, either; Infinity hits shelves this June, alongside a first batch of over 30 character figures sold separately. What interests you the most about Disney Infinity? Though the summer can be a bit dry when it comes to Pixar news, here are a few stories to tide you over until the next major announcement from the studio. The cruises set off from Los Angeles beginning on September 16. Pixar in Concert Debuts in San Francisco: Any fan of Pixar or film in general knows that strong music can bring a great story to powerful new heights. Pixar in Concert exists to remind listeners of this through an orchestral compilation of the most memorable Pixar music. The show premiered this past weekend at the Davies Symphony Hall in San Francisco, and Jim Hill Media provided an excellent summary of the proceedings here. The event continues on Friday, Saturday, and Sunday this weekend at the Hollywood Bowl. The Art of Monsters, Inc. Reprinted: Chronicle Books’ look at the conception of Monsters, Inc. has become a rarity over the years, sometimes fetching hundreds of dollars from online bids. Just in time for Monsters University, though, Chronicle has finally made the sought-after book available on their site once more for $40. Be sure to take a look! Builder Brings WALL-E to Life: Pixar fan works aren’t uncommon, but rarely is as much effort seen in a project as what Mike Senna put into this real life WALL-E bot. It took over two years of hard work to build the creation, but Senna explains that the touching reactions from children made it all worth it in this video from The Yo Show. No Comic-Con for Disney/Pixar in 2011; Sets its Sights on D23 Expo! Opting out of a presentation at this year’s Comic-Con, Disney/Pixar has taken their big announcements to D23! Saturday, August 20, 2011 — 11:00 a.m. – 12:30 p.m. The Walt Disney Studios – "A fascinating behind-the-scenes glimpse at the exciting roster of projects on the horizon at The Walt Disney Studios. From exclusive video clips and live performances to filmmaker discussions and star appearances, this session will be hosted by Rich Ross, Chairman, The Walt Disney Studios; Sean Bailey, President of Production, The Walt Disney Studios; John Lasseter, Chief Creative Officer, Walt Disney Animation Studios and Pixar Animation Studios; and Kevin Feige, President of Production, Marvel Studios." The expo will run from August 19 to August 21, 2011 in Anaheim, California. To purchase tickets and for more information, visit D23Expo.com. Are you planning to attend this year’s D23 Expo?